Insulation batts and blankets are made of glass fiber or mineral wool and are most commonly used in new construction or unconfined areas, like unfinished attics, roofs, and under floors. Blankets come in rolls of up to 64 feet long. 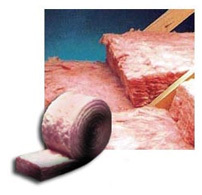 Batts are simply blankets of fiberglass insulation pre-cut into 4-ft. or 8-ft. lengths. Widths are standard 16 in. or 24 in. making these forms of insulation best for wood framing that uses the same dimensions between studs. Thicknesses include 3 in., 6 in., and 9 in., but a 1-in. version is available for special applications like around sills and narrow spaces inside masonry walls. The R-value for each of these thicknesses varies with the material. The choice between batts or blankets balances convenience against costs. Blankets are clumsy to install, but if many batts must be trimmed to fit, greater waste results. Batts or blankets are available faced or unfaced meaning they come with or without backing materials made of foil or paper. Backing materials can serve as vapor barriers. Foil backing works well as a vapor barrier, paper not as well unless it has been treated to reduce moisture permeability.